I finally had to concede to chilly evenings -- my favorite studio time -- and move my wheel to its winter quarters. I'm sorry to see the summer end, but the move to my larger indoor studio is energizing in itself, and has inspired some larger pots. 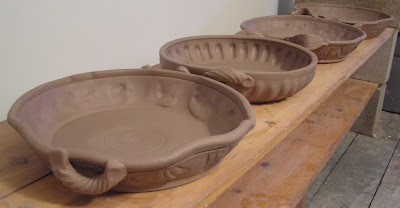 With winter in mind, I made these large baking dishes, since I find the one I made myself so very useful. Every spring the garden lures me out of my studio. I’m always surprised when it happens, because the compulsion to make abates for nothing else, but every year, I spend a few weeks with my hands in a different kind of earth, without a thought of handles, lids, colorants, cones or reduction in my head. It’s a damned inconvenient time for the muse to go on sabbatical, too, with summer events approaching and seasonal stores opening. Why does she abandon me like that? I’ve started to think that maybe she doesn’t. It could just be that gardening satisfies the same impulses that lead me to make pots. Like ceramics, gardening is a creative activity which blends art and science, allowing the two halves of my brain to work together instead of in opposition, or with one dormant, as so many activities seem to require. Using form and color to conjure feelings in the viewer; digging deep into technical knowledge to achieve a desired result; and responding to the random elements that keep our profession always challenging: gardening is similar to pottery in all of these respects. I am looking at a bed of yarrow, bleeding hearts, and snow-on-the-mountain; all chosen for the combination of finely divided, almost Victorian foliage and blooms: a romantic mood carefully created. A piece of pottery might invoke similar feelings; say, this Ingrid Bathe porcelain tea bowl, pinched translucently thin and rimed with a delicate blue tracery of decal, from which I am enjoying my lavender tea. Like the bowl, the plants were chosen for function as well as beauty: they will thrive in the dappled sun on this slope of the yard, and out-compete most weeds. In another, shadier corner the broad bluish foliage of hosta and lush, verdant ferns instill a meditative mood. Springy moss underfoot absorbs sound; this space always seems quieter than the rest of the world. How would I create this feeling, in a pot? Maybe with a wood-fired jar, large and quickly thrown, free of decoration save the marks of the flame. Such a piece requires a thoughtful eye to appreciate it. Like ferns, it whispers rather than shouts with color, like poppies do, or majolica. Though I have sometimes compared gardening to painting (as in: I need a bold splash of red right there), ceramics is the more apt comparison, as the science needs to be right or the result will be disappointing. Just as plants won’t thrive, or, often, even survive in the wrong climate conditions, some surfaces simply can’t be achieved in the wrong firing conditions. Substitute zones for cones, and you’ve got the idea. Basil will fail in poorly drained soil, even if the light conditions are correct, and copper reds will be maroon if over-reduced. No amount of will or wish can make plants or glazes behave contrary to their chemistry, so it’s best to learn those chemical natures and use the information to achieve your results. 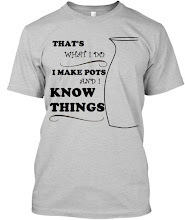 There are folks who simply purchase glazes, and then program their kilns to fire to the desired cone; these potters may enjoy successes but they are relying on others’ science, and are limited by it. 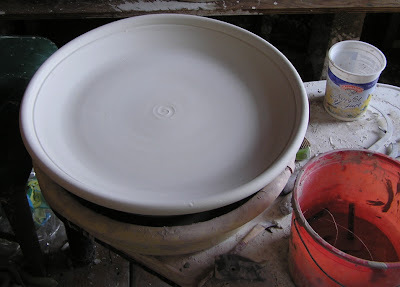 If a surface suggests itself which can’t be found pre-made in a jar, the potter uses what can be, and many potential great pots become adequate instead. Analogously, some gardeners don’t trouble to learn about soil composition or growing zones, and instead buy annuals and replant their gardens each year. Annuals are bright and beautiful, and bloom all summer, but I wouldn’t want to limit my botanical vocabulary to them. My neighbor, who is a gardener of annual plants, would say that the limited parameters make her garden more like a haiku: within strict limits, infinite freedom. Perhaps the same can be said of the pots made with purchased glazes. In any case, that is a topic for another essay. It’s summer now (oh yes it is) and the gardening frenzy has passed. Except for pulling the occasional weed, there won’t be much to do out there until it’s time to put the garden to bed in the fall. So I’m back in the studio, working with renewed energy, and seeing so familiar forms. 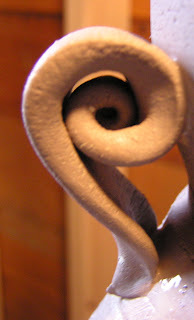 Does the spiral handle on that jar suggest the coil of a new fern frond? And the slip pattern on those mugs makes me think of the speckles in the throat of the lily. Everything I make these days seems botanically inspired. I guess making pots is similar to gardening in one further degree: we have to respect and work within the seasonal rhythms of it. My other interests strengthen and invigorate my work as a potter, and the time I spend out of the studio, far from detracting from my work, provides raw idea material to turn into art. The muse didn’t abandon me, but instead just took a vacation. Luckily she took me with her, and we both returned renewed and refreshed.